One pub a week is closing in London, according to new figures. The Mayor of London said he will increase planning protections after official data showed there were 3,530 working pubs in the capital - a 27% reduction since 2001. Half of all small pubs in London disappeared in the last 17 years, while the number of larger pubs has more than doubled. Sadiq Khan called on Government to review business rates charged to pubs. According to the Institute of Economic Affairs the number of pubs per 100,000 people has been declining since the late 19th century. Across the UK the number of pubs in the UK has fallen by 17%, since 2000, according to the British Beer & Pub Association (BBPA). Last year there were 1,305 fewer pubs in London than 17 years ago. Four boroughs - Barking and Dagenham, Newham, Waltham Forest and Croydon - have seen the number of pubs halve. 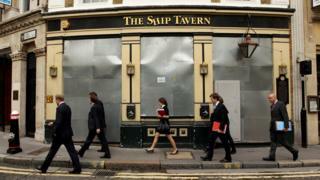 Demolition of pubs has been the most common reason for pub closures in London, City Hall said. Only Hackney has increased the number of pubs over the same period. Seven boroughs saw an increase in working pubs last year - including 10 new pubs in the historic City of London. Despite the closures pub employment has steadily increased - partly driven by an explosion in the number of larger pubs. There were 46,400 people employed in London's pubs last year. The Campaign for Real Ale (Camra) called on all London Boroughs to "adopt robust pub protection policies in their strategic plans and enforcing them in their planning decisions." Mr Khan said: "The traditional London pub has been at the heart of London's communities for hundreds of years, but sadly they continue to face a long-term decline in numbers." "As Mayor, I have made safeguarding and growing London's night-time economy a priority, and am doing all I can to protect the capital's iconic pubs." Video Why are British pubs closing down?